Some of the first usage data is in from Bay Area Bike Share. The data is rough, but the number of trips in the first 12 days is underwhelming compared to bike-share launches in New York or Washington, DC. The Bay Area Quality Management District is still working on getting a real-time data platform set up, but it “will likely not be available in the short term,” said agency spokesperson Ralph Borrmann. Divided by the 12 days in the data set, this works out to about 0.92 trips per bike per day. It doesn’t quite stack up to NYC’s Citi Bike, which hit 1.24 trips in the first two days, or DC’s Capital Bikeshare, which had 1.05 trips in its first 10 days. Of course, it’s still very early, and these usage numbers will change. On peak days, Citi Bike now hits seven trips per bike and on routine days averages between five and six trips per bike. BABS’ results aren’t surprising, either, since bike-share proponents have warned that the small initial size of the system will limit its usefulness. Even with the relatively low level of usage, there have still been anecdotal reports of stations reaching capacity, suggesting the system may have trouble maintaining balance. SF Weekly featured an interview with Mike Sonn last week (many of our readers may know him from the comments section), who uses BABS to commute from North Beach to Redwood City via Caltrain. Sonn said he’s arrived at a full dock at the 4th and King Station, forcing him to find another dock with a free space and walk back. This system has got me back in the saddle after 15 years. I live in the East Bay, and take a Transbay bus. Before BABS I would then get another bus to my workplace. Now I can grab a bike and save the bus fare. I calculate that I will have broken even and paid for my helmet in 10 weeks (I’m an engineer). The only problem I’ve had is getting the green light at the end of the ride. Pushing the bike in hard solved that. I’m still getting used to cycling again, so I’m being very careful, only riding where there are cycle lanes. As I said, I, too, would use it to avoid my bike being vandalized or stolen in the iffier parts of the city, especially in the evening. But for trips over a couple miles, one’s own bike is always going to better than a rental. These bikes have no way to attach panniers, for instance, reducing their utility for much in the way of shopping. If I need to ride any kind of distance, I can probably go five mph faster on my personal bike than on a BABS bike, (and I can guarantee you I’m not the zippiest rider around.) The handling is more responsive on my personal bike, and my personal bike is much lighter and so a heck of a lot easier to get up any real hills. (I think I could get a BABS bike to 18th and Castro easily enough, but not to Castro and 20th, for example.) The BABS bikes have no side mirror like I have on my own, their saddles, while not bad, are not nearly as good as my Brooks one (which was a replacement after my saddle was stolen at the Metreon! ), etc. Though I think the BABS bikes are quite good for their purpose (short distances–the average trip in for Citibike in NYC is 1.75 miles), there’s a reason why we customize our own bikes to our specific needs/purposes and then get so upset when they are vandalized or stolen. For these reasons, even if we had docking stations blanketing the city, I still think anyone who bikes more than a few miles at a time will choose their personal bike over BABS most of the time. on the hills: I haven’t been on BABS bikes yet, since they don’t support my neighborhood (yet), but we have similar [ultra-heavy, upright] ride-share bikes at my work and I routinely ride those suckers up 10%+ grades. The bike has 7 speeds (like BABS) and is geared very low. I simply slowly spin up the hill. Now, I wouldn’t want to ride it up my 18% street in Potrero Hill but I think most bay area (hill-adapted) riders will be able to get BABS up SF hills. On the short-ride commute point- I’d LOVE LOVE LOVE LOVE to ride a ride-share to my gym and back, to restaurants and back, to downtown (for walking around or museums) and back, to dolores park (for fun) and back. I do none of these things on my personal bikes because of lack of secure bike parking. It seems fitting that the BAAQMD hatched the station pattern based on olde-skool San Franciscans, or commuters, and their travel habits (NB–>Downtown, Caltrain–>Downtown)…you know, in a ‘government agencies are run by old fogies and they know what real San Franciscans need’ sort of way. Well whatever, I’ll just patiently wait for my future north Mission station since I’m still a carpetbagger (been in the area ~20 yrs). Perhaps that’s of little comfort. But seeing riders regularly on Oak Street changed my mind over the course of a couple years–realizing that rather than being crazy these guys were letting us know it’s the right and sensible thing, having space to bike there. No better for the curious to have their questions answered than by a happy bike share rider looking to help build momentum. Reading that you’ve been using it BABS in Redwood City demonstrates it can solve the last mile at either end of the Caltrain ride. That’s an even better story you can tell the curious. The station placement in Redwood City, Palo Alto, and Mountain view are all laid out differently. Doesn’t that look like a test of minimum viable spacing and count to best plan the 350 more bikes coming? Bike share is supposed to make it quick, easy, fun and convenient to get from Point A to Point B. With such limited coverage, especially in Redwood City, Palo Alto and Mountain View, BABS is really only useful for getting from Point A back to Point A.
SF will figure it out. We had the same problem in DC with our first system, which was called SmartBike and only a dozen stations. The SF system isn’t convenient for commuting right now, but once it expands to more neighborhoods where most folks actually live, the system will inevitably explode. 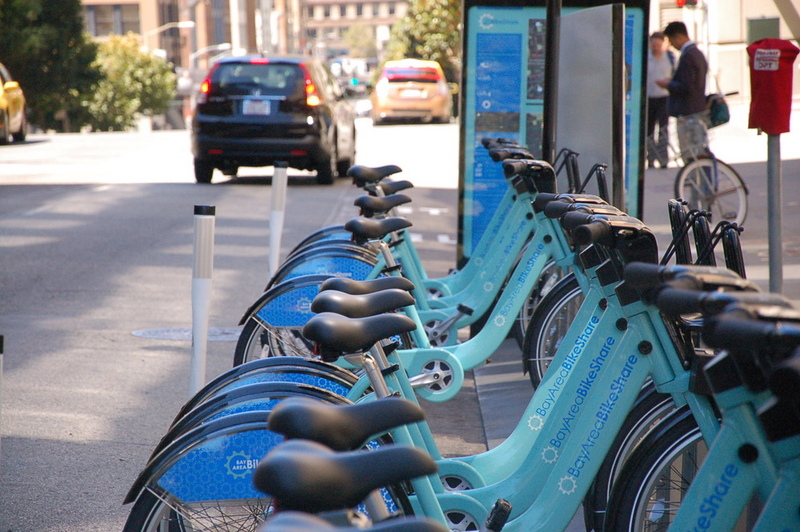 I’ll just admit it – I’m too scared to ride in downtown SF! I love the bike share! I love the whole idea, but when I tried it, I had a whole new appreciation for REAL bikers. I am not one of you, not in this city with these distracted drivers in their gigantic vehicles. My bike helmet won’t protect me from the texting teenager driving the huge Escalade. Took four trips on the bikes during lunch Friday, with destinations that included a bank, a hardware store, DPW and lunch. Was great! Faster than transit or walking, and I didn’t have to worry about locking up my own bike outside where the thieves lurk. Beware the Prius driver most of all. If anything I’ve noticed California drivers pay more attention to bikes and pedestrians because of how strict the laws here and how bicyclists tend to ride with a sense of entitlement to the whole road. You don’t know how good you have it! The streets in SOMA should have been converted to two-way streets a long time ago. Some traffic calming needs to happen so people who get off the freeway realize they aren’t on the freeway anymore. As progressive a city as SF is, you’d think this would have been figured out by now. Bikesharing needs appropriate infrastructure to be successful. With the Bay Area’s bikeshare system there seems to have been a focus on starting in more cities at a time instead of starting with an appropriate amount of density to make the system’s possible convenience apparent. Time will tell if this mistake was fatal or just a temporary blip on the road to progress! Not to mention that San Jose also added bike lanes to nearly every street in Downtown for bike share and other bike commuters. New numbers show the flood of dockless shared bikes in U.S. cities are generating a disappointing number of trips.